It's my pleasure to introduce Karen Collum as our guest today. I love what she has to say here about teaching kids to be optimistic. 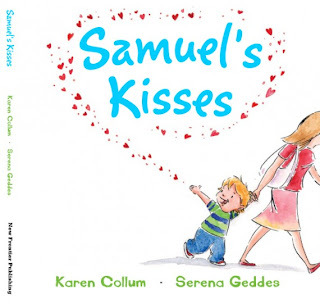 Karen is celebrating the publication of her new picture book, Samuel's Kisses, with a blog tour. If you'd like to participate in the tour, why not visit these other great blogs too? And watch out for my review of Samuel's Kisses tomorrow, here at The Book Chook! 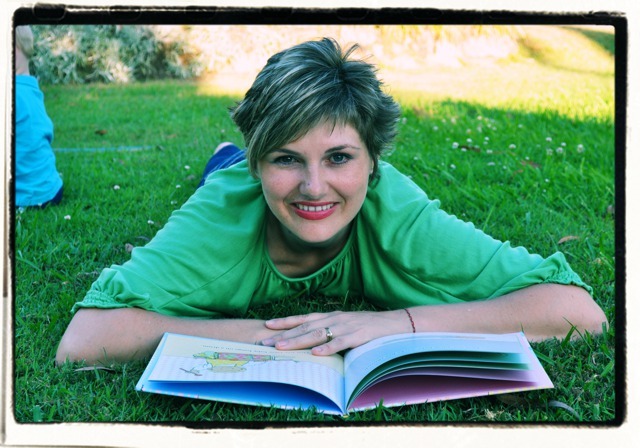 As a mum to three pre-schoolers (with a baby on the way), I have many dreams for my kids. I want them to be fulfilled, to find their place in the world, to discover what it is that makes their heart sing. I also want them to be optimistic. Optimism is more than just looking on the bright side or whistling a happy tune in the face of difficult circumstances. It's a way of living that involves choosing the most optimistic yet most realistic thoughts to explain a situation. It's about minimising stress over insignificant things (like not getting a toy they wanted) and saving big emotional reactions for big events (like the death of someone they love). And contrary to popular belief, optimistic thinking skills can be learned. The founding father of optimistic thinking is widely regarded as American psychologist, Dr Martin Seligman*. His thorough research suggests that genetics do indeed contribute to whether we are optimistic or pessimistic in nature, but genes only count for approximately 25%. That means the other 75% of our optimism is learned. That's an exciting concept, especially since optimists have been found to live longer, healthier and more fulfilled lives than their pessimistic counterparts. And the single-most important skill is learning that feelings are not a result of what happens to us; rather, our feelings come from what we say to ourselves about what happens to us. Our thoughts lead directly to our feelings. I actively teach my children to be optimistic thinkers. When my five-year-old is having a meltdown because one of his younger brothers knocked down his tower and wails, "I'll never be able to build it that way again," I'm sympathetic. I tell him how sorry I am that his tower has been ruined and that I'm sorry he's feeling sad. But then I remind him he can choose how to think about the situation. He can either think, "No tower I build will ever be as good as that one," in which case he'll spend the immediate future and beyond feeling sad and miserable, or he can say to himself, "I'm sad my tower was knocked down but I built it last time which means I can build an even better one this time." He'll still feel a little disappointed but the negative emotions won't last nearly as long and he'll be back to feeling good quick smart. At five he has already mastered the basics of optimistic thinking. I believe learning the optimistic thinking skills empowers our kids to be in the driver's seat in their own lives. Like all of us, kids often have little control over what happens to them but they can learn productive ways of managing the challenges that they'll face. They can learn that they're powerful in their own lives, and can actively influence the way they feel about a situation by choosing the most optimistic and realistic explanation of what has happened to them. And that's why I write optimistic books. I want children to be empowered, to feel like they can make a difference in their own lives and in the lives of those around them, regardless of how young they are. My debut picture book, SAMUEL'S KISSES has optimism at its heart. It's the story of one toddler's kindness to complete strangers through a blown kiss and the flow-on effect this has on people around him. It's the sort of book that will make you and your child smile and fill up your 'warm and fuzzy' tanks. We all want our kids to be happy, but wanting them to be optimistic and teaching them the skills to achieve this will have a far greater impact than the oft- fleeting emotion of happiness. *Two of Martin Seligman's books that I highly recommend are The Optimistic Child and Learned Optimism. Karen Collum is a mother to three beautiful boys, with a baby girl about to join the family in December 2010. Prior to motherhood she was a primary school teacher. She is passionate about developing optimism in children and empowering them to make a difference in the world. To find out how to purchase your copy of Samuel's Kisses and to read more about Karen's work visit her website. What a lovely visitor! Thank YOU for spreading early cheer. Thank YOU, Queen of the Kisses! I really enjoyed Karen's post on optimism. By encouraging children to look at the positive rather than the negative, we're empowering children with valuable life skills. Being optimistic isn't an easy skill to master. Many adults are crippled by negativity everyday, usually it's from the little voice inside their head. Thank you Karen for reminding me that children need encouragement and support to focus on optimistic life. I've really enjoyed all Karen's posts, Rebecca, and learn lots too. Renee, I believe you've summed it up exactly. That little voice that is so corrosive with its self-doubts and negativity. It's great when writers can accentuate the positive in their stories - something I think Samuel's Kisses does so well. What a great angle for the blog tour, BookChook - and a worthy mission in life, Karen. Great post. Thanks, Renee. You are so right - it's the little voice in our head that plays over and over again that contributes to whether we experience joy and fulfilment in life, or negativity and disappointment. The good thing is that by teaching our kids optimistic thinking skills, we are actively programming their self-talk to be positive! It's such an exciting concept. Thanks Karen and BookChook. If ever there was an important message this is it! Optimism's cousin is resilience - and kids and adults alike need that as well. So true Janeen. Thanks for adding to the discussion!